UnblockUPC Ransomware is a peculiar ransomware infection because it does not encrypt your files. Normally, one would expect a similar infection to encrypt tons of user’s files and then basically render the computer useless, but this program here does nothing of the sort. It will display a warning message on your screen, and it will look slightly alarming, but there is no need to panic because you can remove UnblockUPC Ransomware without any difficulties. It might be that the program’s setup may change in the future, and it will start encrypting user files, but when that happens, you will be ready to fight it. We say that you will be ready because it is not just about the removal process that is important when you battle malware. In fact, prevention is probably more important than that because by protecting yourself from similar intruders, you will save a lot of time and money you would spend on battling them, otherwise. Consequently, to protect yourself from such infections, you have to know how they spread around, and what can be done to stop that. The most common ransomware distribution method is spam email campaigns. A lot of spam emails involved in ransomware distribution nowadays look like legitimate messages from various financial institutions and even online shopping malls. These messages may manage to drop into your main inbox, and they will look like invoices from banks or your online shopping accounts. You may also feel inclined to click these attachments and open then, but this is exactly how ransomware then gets installed on your PC. Once again, we are really lucky that this program does not function properly. 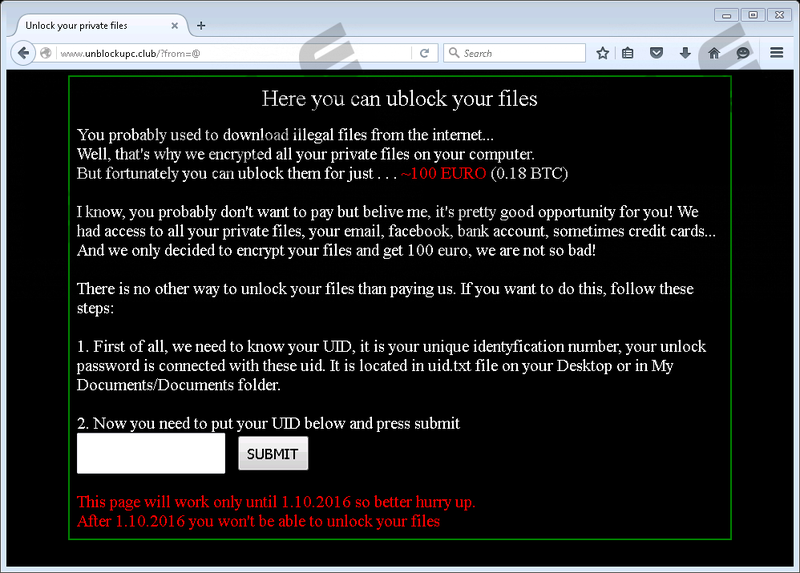 When UnblockUPC Ransomware enters your system, it slaps a warning message on your screen. The warning message appears on a black background, and the text itself is see-through. It actually appears on top of any window that you currently have opened. The good thing, though, is that this message does not block your computer. Quite a few ransomware infections lock users out of their computers, not allowing them to use the machine properly anymore. If you click the links to these websites (which you should not do, by the way), you will see that they are absolutely identical. In fact, you already know that there is no use clicking those links, as the program does not affect your files in any way. To close the message on your screen, you need to click the Del button. It should be enough to make it disappear. Now, as far as the infection is concerned, it is not possible to remove UnblockUPC Ransomware via Control Panel, but you can simply delete the installer file that set up the program. To find the installer file, check out your Downloads folder or any other directory where you save downloaded files by default. Look for any executable or suspicious file with a random name. It would be for the best to arrange the downloaded files according to their dates, so it will be easier to notice this file because it should be at the top. If you find this too troublesome, you can always invest in a powerful antispyware tool that will scan your PC for you, detecting all the potential threats at once. Let us not forget that malware infections often travel in packs. Thus, along with UnblockUPC Ransomware, you may have more unwanted and dangerous programs installed. An automated software removal is the most efficient way to get rid of these threats because you will also protect your system from other unwanted programs in the future. Should you have any further questions about the ransomware infection your computer’s security in general, please be sure to drop us a comment. Locate a suspicious file with a random name. Scan your PC with the SpyHunter free scanner. Quick & tested solution for UnblockUPC Ransomware removal.